The story begins one year after the fight between Spider-Man and Venom that left his mother dead and father injured. Spider-Man, aka Miles Morales decided to give up being a superhero. 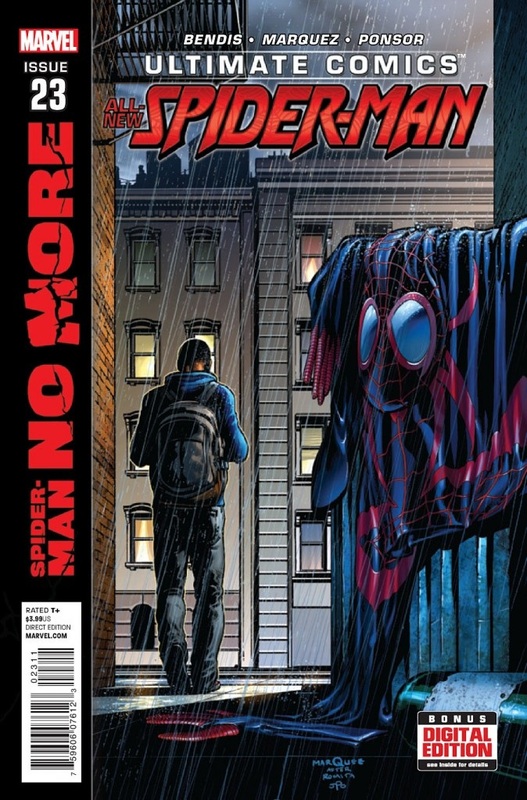 Outside of being a superhero, Miles Morales is an ordinary teenager living an ordinary life. He has his best friend, Ganke, at his side. There’s also a teenage Katie Bishop, Miles’ girlfriend. Miles feels that since he is no longer Spider-Man, he can tell Katie about his secret past. However Ganke warns him against it, fearing that Katie will be put in harms’ way if she learns the truth. At a rendezvous with Spider-Woman, Miles became upset when she tried to hand him a briefcase. After a brief dispute with her, Miles took off, leaving the briefcase behind. I really enjoyed this story. Well-written dialogue that is easy to read for all ages. I especially like the exchanges between Miles and Ganke. Short and to the point. But Miles appears in need of an attitude adjustment, having telling both Ganke and Spider-Woman (on separate occasions) they need to respect him. But then again, typical teenager. Although I haven’t read this series in a while, I can definitely see a difference in the physical appearance of an older Miles Morales. He lost the baby face and although he is still cute, he is now a teenage boy with the height and attitude to go with it. Thanks to the creative team of Dave Marquez (artist) and Justin Ponsor (colors) for the visuals. Well defined features, especially Miles and Ganke. I plan to continue reading the series to see where it’s heading. With Bendis as the writer, it can only go one way. UP. I recommend Ultimate Comics Spider-Man for all ages.